Shelly, your card is gorgeous!! Love the selection of colors and that snowflake is so pretty!! Yes, we have had lots of snow too, but now it's melting as temps rise again!! LOL!! Lovely card, and your snow looks just like a picture postcard! 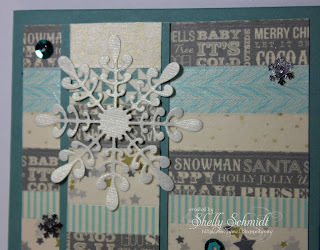 Gorgeous card Shelly, I love the colors of the washi tape and that beautiful snowflake! We had snow last week and more to come this week! Take care! Another pretty card. Your colours are stunning together. I must look up this technique. Love the colors in your card...Anyway, thank you so much for sharing your wonderful project with us this week at Word Art Wednesday. Leaving you with the encouragement of God's Word in Psalm 27:1 which says, "The Lord is my light and my salvation— whom shall I fear? The Lord is the stronghold of my life— of whom shall I be afraid?" Hugs and blessings! This is absolutely gorgeous, Shelley. Love the variations in color and the beautiful sentiment. The weather does change fast around here doesn't it? While we had some snow it melted quickly here. Both of your pictures are beautiful. Happy Thanksgiving! This is gorgeous and I love the colours. The sentiment is perfect for it too. Wow, do you have a lot of snow! Just a skiff on the ground here and we got that last night. It can stay away and so can the cold temps... brrrr. Those first cold days seem like I'm in a freezer but I guess it's that time of year and a couple more weeks and I'll be used to it. Grand idea with the washi tape. Just called hubby over to see the photos of your garden and he was struck by the difference with the red tree minus its leaves covered in snow. We have had a small flock of Redpoll arrive in our garden today from Scandinavia. they have been busy feeding on the bushy flowers that I let go to seed for the birds to have during winter. It is getting colder here but so far no snow. Hugs Mrs A. Love these cards with Washi Shelly !! You have snow!!! So sorry, my new city still has flowers blooming!! Hugs! P.S. Glad we played your Bears early in the season. They seem to be really gelling now! 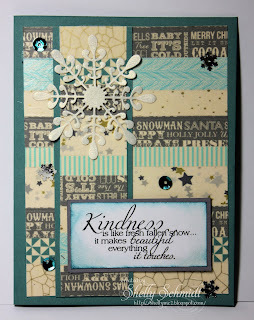 Lovely winter card! We didn't get the snow here in Missouri but the temperature sure has dropped a bunch. Not sure I am really ready for the cold weather. More washi inspiration. Love it. Maybe I'll actually pull mine out and use it. This would be great for a Herringbone pattern as well.